Dachshunds are available in two sizes, standard and miniature. Otherwise known as the "sausage dog breed," the Dachshund has a low, long and muscular body, enabling it to move freely in a tunnel or den without sacrificing the jaw and body strength it needs to overcome its quarry. Agile and with great stamina, Dachshunds have three types of coats, smoothhaired, longhaired and wirehaired, each providing a different level of protection against the weather. The Dachshund dog breed has a pleasant, energetic expression. Doxies may train you before you train them! The Dachshund originated in Germany. Standard Dachshunds are 8 inches. Miniature Dachshunds are 6 inches. Standard Dachshunds range from 16 to 32 pounds. Miniature Dachshunds are under 11 pounds. Dachshunds can be any color, except white. 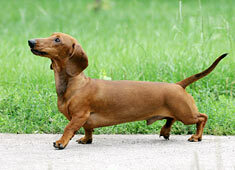 Standard and Miniature Dachshunds have three coat types. The smoothhaired coat is short and shiny, the longhaired coat is of medium length and slighty wavy and the wirehaired coat is thick and hard. The longhaired and wirehaired coats require more attention for grooming purposes. Dachshunds' temperament depend on their coat type. The smoothhaired Dachshunds are usually alert and friendly, while the longhaired Dachshunds tend to be more apprehensive and reserved with strangers. Of the three, wirehaired Dachshunds tend to be more lively and active, but stubborn. 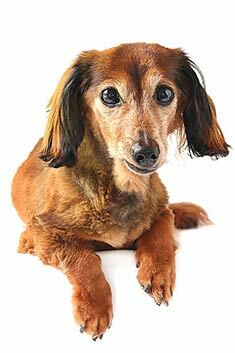 The Dachshund is susceptible to genetic eye disease, disc and skin problems. The expected life span of the Dachshund is 12-14 years. Dachshunds do well in apartments as long as they get daily exercise. Owners should be aware that Dachshunds can be noisy. The Dachshund is in the Hound group. The feisty wiener dog, a member of the hound family, was bred to flush badgers and other small animals from their burrows. The German phrase der Dachs means badger and der Hund means dog, combining to form the word Dachshund, or badger dog. The miniature Dachshund was bred to hunt rabbits. The toy Dachshund is not recognized in the English-speaking world, but in Germany, it is called a kaninchen, meaning rabbit. 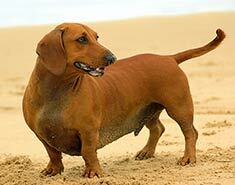 Standard Dachshunds weigh anywhere between 11 and 32 pounds, while miniatures weigh 8 - 11 pounds. Anything below 8 pounds is considered a toy. A Dachshund displays his sausage-like physique. AKC statistics show the Dachshund to be the 6th most popular registered dog in the United States. They are especially popular in urban areas, where their small size makes them good apartment dwellers. Many cities hold Dachshund races, known as the Wiener Nationals, but the Dachshund Club of America opposes this practice due to the potential for injury to the dog. In addition, wiener racing is often used to draw crowds to the more conventional greyhound races held at many tracks. Many famous people have owned Dachshunds, including William Randolf Hearst, Pablo Picasso, Jack Ruby, and Andy Warhol. In addition, the breed has been featured in several TV shows and movies, including Slinky in the Toy Story movies, Hundley in the Curious George books, Odie of Garfield fame, and Schatzi in That '70s Show. There is a plethora of ways the Dachshund may look. The most common coat variety, what most of us would recognize as a doxie, is the smooth-haired coat. Second most common is the long coat, while the wire-haired coat is relatively rare. Colors are even more varied than coat texture. The breed standard recognizes red (a dominant color genetically), black and tan, black and cream, cream (also dominant), chocolate and cream, chocolate and tan, blue and tan, and Isabella and tan. An Isabella and tan dog looks like a washed-out chocolate and tan, resulting when a blue and tan is bred with a chocolate and tan. The reds may range from copper to deep rust. Solid black and solid chocolate dogs do occur, but are disqualified from conformance competitions, as they do not meet the standard. Color patterning is also complex, producing piebalds, dapples, double dapples, brindle, brindled dapple, and sable / wild boar. The piebald is a white dog with spots, similar to a pinto horse. The spots may be large and may contain other patterns such as dappling. Spots may also be small, like freckles, know as ticking spots. Dapples have lighter-colored spots contrasting with darker areas of the same color. These dogs may have a small amount of white on the chest. A double dapple Dachshund has some spots of white over the body, in addition to the traditional dapple pattern. Double dapples must never be bred to dapples or double dapples, as severe birth defects are likely. Therefore, double dapples should only be bred to solids. Brindle coloring appears as stripes all over the body, similar to a tiger's coloring. Usually brindles are either red or cream. Brindled dapples are dogs that have tiger-striping on half of the dog's body and dappling spots on the other half. Sable and wild boar patterns appear to be black and tan from a distance, as the red undercoat is covered with a heavy layer of black. The sable pattern is more common in long-coated dogs while the wild boar pattern usually occurs in the wire-coated variety. Both are uncommon. Because of the variety of sizes, colors, coat textures, and patterns, probably the best way to identify a doxie is by its length in proportion to its height. Like the Bassett hound, the Dachshund is a very long dog, often leading to jokes involving two zip codes. Gary Larson's The Far Side comic strip often features a wiener dog, chosen because of his distinctive shape. H.L. Mencken has said that "A Dachshund is a half-dog high and a dog-and-a-half long," an apt description. A huge alligator swallowed a plucky Dachshund who promptly chewed her way out. The eleven foot gator was found floating belly up in the pond the next day, and Daisy, obviously a lot tougher than she looks, was back pawing at her family's door. "The dog didn't have a mark on her, since the gator gulped her down whole," says Melanie Nelson, Daisy's caretaker. "We'd lost dogs to gators before," Melanie recalled. "It's a hazard of living out here. But this is the first one who has ever come back." Not someone you'd want to tangle with! However, doxies are extremely loyal and devoted to their guardians. This small dog does not realize he is small! He has no trouble chasing larger animals, including other dogs. Your yard may show the results of the chase, if the animal tunnels underground to escape. The doxie will tunnel in right after the varmint! Dachshunds are standoffish towards strangers, and their loud barks make them good watchdogs. Like many dogs, doxies are happiest when they have some company. Prone to separation anxiety, they become destructive when left alone too long. The breed is not the greatest dog for homes with children, as they may sometimes be a bit snippy. Of particular concern for the Dachshund is the propensity for intervertebral disk disease, what we call herniated disks. The long spinal column combines with a short rib cage exposes the disks to damage as the dog ages. Faced with back pain, the dog may bite if a child picks him up the wrong way. Also, obesity places additional strain on the dog's back, and many children delight in over-feeding dogs. To prevent injury, it is recommended that the dog be kept at an appropriate weight and be discouraged from jumping, which can help to prevent injury. If you hold the dog, keep his body level and do not expose him to rough handling in order to protect his spinal column. 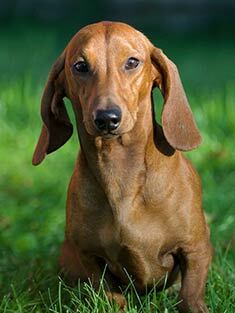 Although doxies are very intelligent, they are often difficult to train, as they are also stubborn. They don't always think it is important that they use the bathroom outside, particularly in bad weather. You must be patient and consistent to train a Dachshund to do anything! The Foxy Dachshund lists ten reasons why should you have a Dachshund, which pretty much sums up the breed. The original source of the list is unknown, but Mary Pyle provides the commentary (in italics). He is an ideal companion as a pet. He will follow you, love you, and amuse you all day and every day. You are graciously allowed to share your bed & board with him. You will trip on him, and watch him laugh at your clumsiness. He is a born sportsman. He will turn his nose to anything above ground, while below ground, he will, given his chance, and hold his own with the best. Dachshunds were originally bred to dig badgers out of holes. He will chase all pet cats, birds, & dogs from his exclusive territory (which is as far as the eye can see). He will also roto-till your fresh-laid lawn and new flower beds. What they don't want to see and don't want to hear does not exist. From behind a fence there is none braver. He is odorless, always clean and easily housebroken. He comes in several sizes, colors and coats to suit your special taste. The tiny miniatures also come in all three coats and colors; smooth, longhaired and wirehaired, and from a beautiful shiny black and tan to a rich Irish Setter red. There is no other breed, which offers such a selection. They are like peanuts, you can't stop with just one, and there is always a new variety or color or size to drool over. If it is cold, they are in your bed or in their sweater. If hot, they grab the seat in front of the air conditioner and drink out of your iced tea glass. He asks only that he be with you whether you live in a mansion or the most humble abode. He is at your side day and night and he will warn you if any strangers are lurking about. He is willing to share all you have, if you eat dog food, he'll eat dog food. If you have steak, he gets steak! You couldn't get rid of him if you wanted, and anybody stranger than you SHOULD get barked at. He is most affectionate, and delights in riding in your car or sleeping close to you (if you will let him) at night, but he is content with his own bed and a simple cover that he can pull over his head, with just a shiny black nose to show his presence. Just to be near you and show his love for you is all he asks. He is not stupid enough to let a good sucker out of his sight. People are such pushovers for the old "I love you, I love you" routine. He is a wonderful companion for your children, and will take a lot of rough play and enter into the spirit of fun, for he is a born comedian. You can trust a Dachshund for they have never been known to betray a confidence. They love kids, the younger the better. Children can be blamed for so much that the "sweet li'l puppy-wuppy" couldn't possibly have done (they don't realize how tall a fully stretched Dachshund can reach). A Dachshund will never write a tell-all unauthorized biography, but don't leave your pot roast within reach. ONCE YOU HAVE OWNED ONE, YOU WILL NEVER BE WITHOUT ONE! ONCE YOU HAVE BEEN OWNED BY ONE, THERE IS NO HOPE FOR YOU. Find Dachshund Puppies with our Free Breeder search!